Introducing the new 2018 Large Scale Smoke Generator! 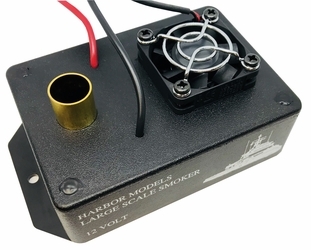 Two leads to your speed control output (for proportional throttle output) or two leads direct to 12 volts (for full smoke output when on), two leads direct to a 12 volt power source (for fan) and installation is complete. For more information about installation download the instruction sheet below. Download the Instruction Sheet for more details. Clear Tubing - 5/8" I.D. Now you can plumb your smoke generator with ease. This clear polyurethane tubing makes avoiding in-hull obstacles simple. The tube also slides right over the smoke generator's output with just the right amount of friction for a tight seal while still allowing for easy removal when re-filling. Have more than one stack, no problem. 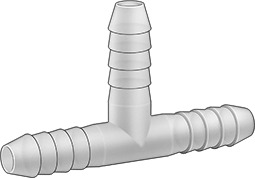 Use this "tee" to divert your smoke to multiple outputs. Have a 12 volt battery and need to run 6 or 3 volt lights? Here is the perfect solution. 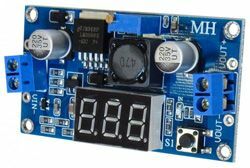 Easily wire in 12 volts, dial down the easy-to-read digital meter to whatever voltage you require and hook up the lights to the output. Simple as that. Not for use with motors or high current hardware. For larger current draw applications use the Harbor Models' Power Distribution Panel. Output: 1.25-37V adjustable, 1.5A continuous current. Two 2-position screw terminals for easy wire insertion. 2.6" x 1.4" x 0.5". Mounting holes.